I am afraid of the dentist! I know...I know...who isn't! But I truly have a deep rooted (pun intended) fear of the Dentist. So much so, that I must be “put under” just to get a cleaning. I am not a “fearful” type of person and in actuality, I rather “enjoyed” (ok, maybe not enjoyed but I was NEVER fearful) going to the Dentist up until 3 years ago. I am not positive but it could have been the fact that they told be that I was in the beginning stages of Gingivitis...who's isn’t though, I mean really?!?! And the fact that they used words such as “deep pocket cleaning now required”. All I know is after that visit, the thought of having them “deep clean” anything did not sound AT ALL pleasant and sure enough when they attempted to do that procedure on me, I went into an immediate panic mode and cut the visit short...right on the spot. I was not having THAT “drily sound thingie” come anywhere near my “deep pocketed”, pearly whites. The Dentist was adamant that I needed the cleaning and I was equally adamant that it was not going to happen...then or ever! 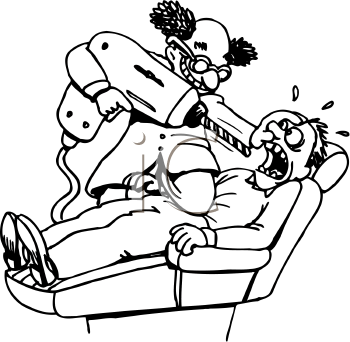 He then told me all about this wonderful invention called “sedation dentistry”. I had heard about people “going under” for dental surgery but never for simple cleanings. Apparently, if there was ever a good time to become deathly frightful of dentistry, well, I had picked the “right” time. It’s really rather a simple process, I take 2 pills 1 hour before my appointment. I get “loopy”. Someone drives me there and walks me “in” (because you tend to become a little unsteady on your feet after taking sedation medication...who knew...LOL). I sit in a chair. They give me more pills. I wake up and my teeth are cleaned and shiny. Oh wait! I skipped a step. I get driven home from someone who must then almost carry me upstairs and then I sleep for about 14 hours straight THEN I wake up and my teeth are all cleaned and shiny....LMAO! Any who, I am heading for my yearly “deep pocket cleaning” tonight (Yes, my Dentist is opened until 9pm...strange eh?). Therefore, because of the above mentioned “simple” process, I will likely me out of commission tomorrow. What a “flippin’” production! But the only thing I fear more than the Dentist itself is the fear of having to have dentures. So, if I gotta “go under” to keep these pearly whites...so be it! I work in the "sedation dentistry" field and just to let you know "oral" sedation isn't always the safest way to be sedated! Look for "IV" sedation, it's much safer,your not out of commission for days and you feel amazing afterward! You still need the driver to and from but you are usually feeling pretty good by the evening, if you have it done earlier in the day. Just wanted to share this, not that oral sedation is bad, but there's something even better!